CEDAR CITY — The National Weather Service in Salt Lake City has issued a wind advisory, which is in effect from 10 p.m. Saturday until 6 a.m.
Monday. Affected areas include north-to-south oriented canyons in Washington County (see map). North to northeast winds 25 to 35 mph, with gusts up to to 50 mph, are expected. The advisory includes a caution about strong crosswinds on east to west oriented roadways. Lightweight and high profile vehicles will be most susceptible to these winds. Motorists in the advisory area should be prepared for sudden gusty crosswinds, which can make driving difficult. 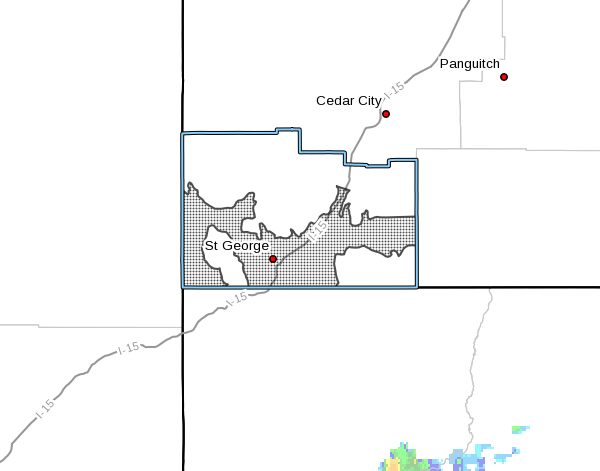 Additionally, the hard freeze watch issued for the Cedar City area earlier has been discontinued and upgraded to a hard freeze warning starting at midnight Sunday and lasting until 9 a.m. Monday morning. Temperatures as low as 25 degrees are expected along the Wasatch Front and in the low to mid 20s elsewhere. The warning means sub-freezing temperatures are imminent or highly likely. Such conditions will kill crops and other sensitive vegetation. According to the hazardous weather outlook issued Saturday for the western two-thirds of Utah, sub-freezing temperatures are highly likely to occur early Monday, with the coldest expected temperatures coming just before dawn. Gusty winds and a cold front are also expected to arrive in other areas of Utah Saturday evening. The strongest winds can be expected near Wendover, across Castle Country and near canyons in Washington County until Monday. For more information on current weather conditions and advisories, visit the National Weather Service-Salt Lake City office website. Southern Utah weekend weather: Expect more rain...and what's that white stuff up there?